As national media organizations contemplate how to mitigate their trust deficit with the American people, a solution emerges from the 2018 Poynter Media Trust Survey: Bag the coverage of President Trump and Congress and the EPA, and go wall-to-wall on zoning hearings, bus-route changes, liquor-license revocations and softball games. Local news, that is. The survey, after all, shows that people trust sources of local reporting far more than national outlets. The numbers: Whereas 76 percent of Americans register a “great deal” or “fair amount” of trust in local television news and 73 percent feel likewise about local newspapers, the corresponding numbers for network news and national newspapers are 55 percent and 59 percent, respectively. There’s no great mystery to this dynamic: When people see firetrucks clustered around the corner, and then read a write-up in the newspaper, they’re inclined to believe the latter. National coverage is another beast: It’s worlds away from the front stoop, it’s commonly beamed to consumers from cosmopolitan centers and delivered by smooth and attractive types in perfect suits, and it’s wrapped up in divisive politics and ideology in ways that don’t apply to local controversies. “Most local journalists are not covering things that relate to national politics. They may be covering high school sports, local business, education and crime affecting their communities,” noted Joy Mayer, director of the Trusting News Project, in Poynter’s article on the survey, which was authored by Andrew Guess of Princeton University, Brendan Nyhan of the University of Michigan and Jason Reifler of the University of Exeter. 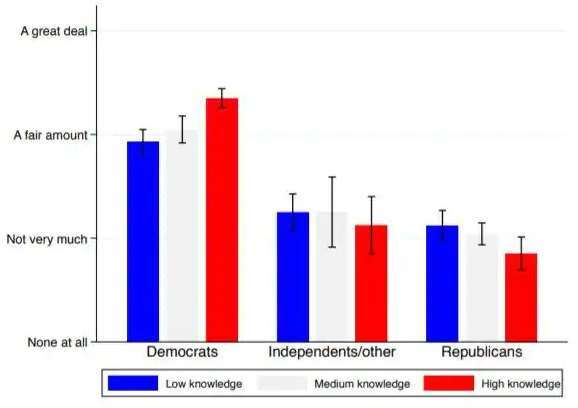 Note how greater levels of political knowledge (which the study defines as “those who score highest on a battery of factual questions”) correlate with higher levels of media trust among Democrats, with the opposite dynamic on the Republican side. The gap would have trouble being much wider: So-called “high-knowledge” Democrats have a 98 percent trust rating vs. 11 percent for Republicans. Surely Trump would cite this figure with relish, as he did in a comparable situation during the presidential campaign. The upside: Overall, Democrats and Republicans alike report modest upticks in media trust compared with past benchmarks. So why the slight improvement? Perhaps because the U.S. media — along with Republican primary opponents — portrayed Trump in the 2016 presidential election as an incompetent, soulless liar — and he has gone on to govern as an incompetent, soulless liar. Folks can see that as clearly as the house fire around the corner.